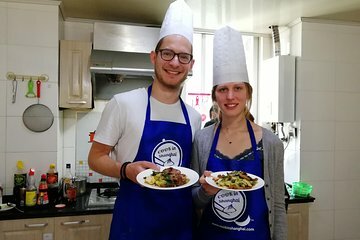 Immerse yourself in Chinese culture with this cooking class in Shanghai. First, visit the local market where you’ll learn how to pick the best vegetables plus how to buy them for the best price. After that, head to the kitchen of a local home cook to prepare two to four dishes, typically a meat dish with a soup and a vegetable side. In front of Agricultural Bank of China: 301 Zhaojiabang Road (Near Damuqiao Road). It's near by exit 2 at Jiashan road metro station (Line 9). The translator speaks great English and takes you on a neat Wet Market visit in the neighborhood. I did find the kitchen somewhat cramped and we had to take turns cooking our dishes so some were cold by the time we ate. Also, be careful what dishes you choose as we found that all 3 dishes were very very oily. Still, the cooking class was easy to follow and tasty. Erica made it all worthwhile. Smart, funny and knowledgeable. Great to have such a guide. This was a fantastic experience. Great value for money. I would recommend this to anyone who wants to learn some Chinese cooking. There were 7 of us in the class and we each got to cook 3 recipes. Great guides who looked after us and made sure we got the most out of the class. Cooking location was very good. Chef and translator were helpful and patient. Learned new things about treatment of ingredients.